Because we don’t normally see groundwater – it’s underground and ‘out of sight is out of mind’ – it is often not until a problem arises that it comes to public attention. These problems can include too little groundwater, too much groundwater or groundwater quality changes. The natural pattern of flow of groundwater is altered by human activities, either deliberately, by pumping water from wells or by diverting watercourses, or inadvertently by land use change. Managers and regulators seek to limit these impacts by controlling and licensing activities that may result in undesirable changes. If the rate of abstraction from an aquifer is too high, and exceeds the amount of water recharged from rainfall, the water level in the aquifer will fall. This increases the cost of pumping, and at the same time tends to reduce the yield of individual boreholes, but it also can affect the flow of rivers and streams where they are supported by groundwater. Put high rates of abstraction together with a dry summer, and rivers and lakes may begin to dry, with consequent impact on wildlife and amenity. Not all low flows in rivers are due to groundwater abstraction – river flow is also affected by changes in the climate, and by changes in land use. Modern abstraction schemes are often designed to put back as much treated waste water into the river as would have naturally flowed in from groundwater. Too much groundwater can also be a problem. In wet winters rising groundwater levels can flood into cellars and onto low-lying land. 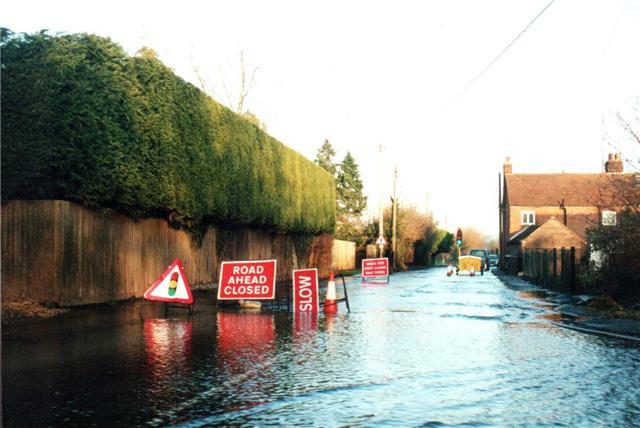 Because groundwater tends to react slowly, this type of flooding problem can be long lasting. Unfortunately damage from groundwater flooding problems are often our own fault – land that is naturally prone to flooding is built on, and flood cellars are converted into living space with furnishings and fittings. A particular problem occurs in areas where past over-abstraction had lowered groundwater levels, and now reductions in pumping are allowing groundwater levels to rise. London provides a good example. Heavy pumping in the 19th century lowered water levels, and subsequently much of London’s infrastructure was built while levels were low, including parts of the London Underground and the deep foundations of tall buildings. In the 1960s, changes in water use meant that pumping rates were reduced drastically, and water started to rise back towards its natural levels, threatening the tube lines and building foundations. Recently managed pumping has been started to control the rise. Similar problems occur in other cities, and in old mining districts. While much groundwater is of good quality, like any water resource it is at risk from pollution. 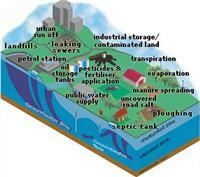 Pollutants on the land surface can be flushed through the soil and rock into groundwater. Pollution occurs from diffuse sources, when pollutants are spread over wide areas, for instance when pesticides or fertilizers are used on agricultural land, and from point sources, for instance chemicals leaking from a storage tank or landfill. Once a pollutant reaches an aquifer, its impact will depend on its chemistry, on the nature of the aquifer and on the distance between the source of pollution and the point at which groundwater reaches the surface again, either in a river or by being pumped. Some pollutants will naturally degrade, or will be filtered out of the water as it flows through the aquifer. Others will be persistent and need to be removed before the water can be used. It is best to prevent groundwater pollution as it is not always possible to remove pollution and clean-up operations are expensive. Rising groundwater can bring quality problems to the surface. In cities, pollution that has soaked into the ground from industrial spills can be ‘trapped’ in the unsaturated rocks above the water table for decades - rising groundwater levels can flush out this pollution into local rivers. In mining areas, groundwater levels were historically kept low by pumping to stop the mines flooding. When the mines close, and pumping stops, groundwater gradually floods the mines, and dissolves minerals from the walls of the mines. This polluted groundwater may then discharge into local rivers.